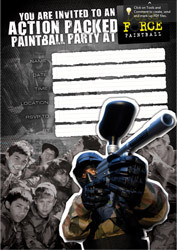 Give your friends printed paintball invitations for that personal touch when arranging a day out at the Ottawa Paintball Centre. 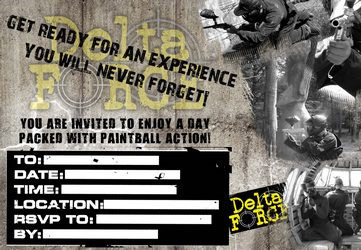 Organising a group for an event can be quite hard, so we’ve created some printable invites to help you out. You just need to fill in the details and send them to your friends. Pre-filling a registration form will save you time. Also, if you are under 16 you will need a completed Parent Information Document. If you can get these forms out to your group a week before the game day, everyone will benefit from faster entry into the centre. Less time waiting around, more time having fun!